It has been a low key goal of mine to hit level 50, the original level cap, in EverQuest during this, its 20th anniversary month. Of course, I don’t want to do that on one of their retro servers. A live server will do me just fine. And that there is an experience boost active on live servers through the end of the month is all the better. I want to be a tourist. I want to see the sights, not get in there and grind away. This goal was prompted by the fact that I seemed on a pace to get there, so why not keep on track to make it happen. All I seemed to have to do was go visit the daily hot zone quest giver on the Plane of Knowledge every day and run the quest he gave me. 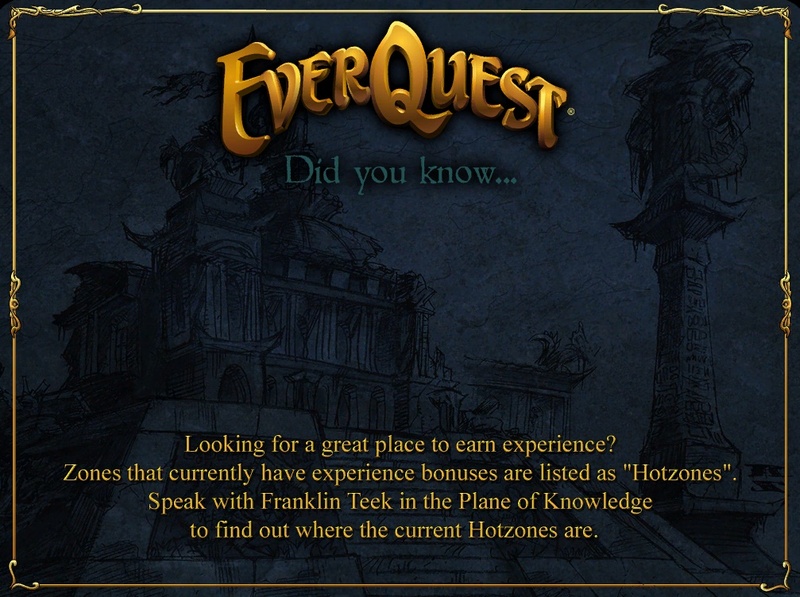 Bonus hot zone experience on top of anniversary bonus experience was popping me up a few levels every day. There was also a nice piece of equipment as a reward and it got me out into the world to see zones I had not visited in years, or may have never visited. And then I took the level 45 quest that sent me off to the Scarlet Desert and things began to go awry. Norrath is a big place. 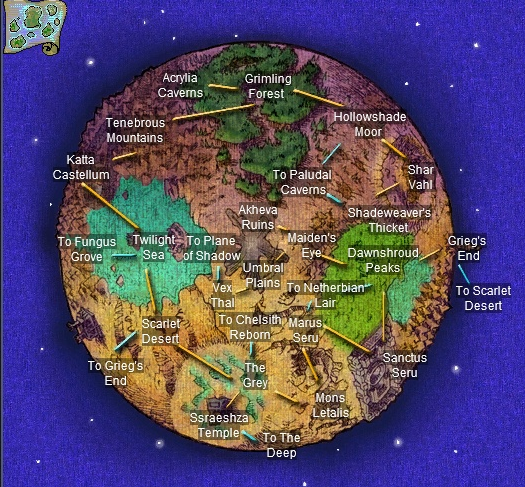 As we saw from the infographic they put out for the 20th anniversary, there is a lot of space and a lot of places in EverQuest. This is not helped by the fact that I haven’t really played EverQuest actively at level in the current content since some point in 2001. That was 18 years ago. Maybe my playing into some of The Serpent’s Spine content when it launched might count, but even that was back in 2006, at the start of the life of this blog, now nearly 13 years in the rear view mirror. Basically, the game has grown far beyond my ability to comprehend, and I have forgotten a lot of even the bits I used to know. Still, I was managing okay. 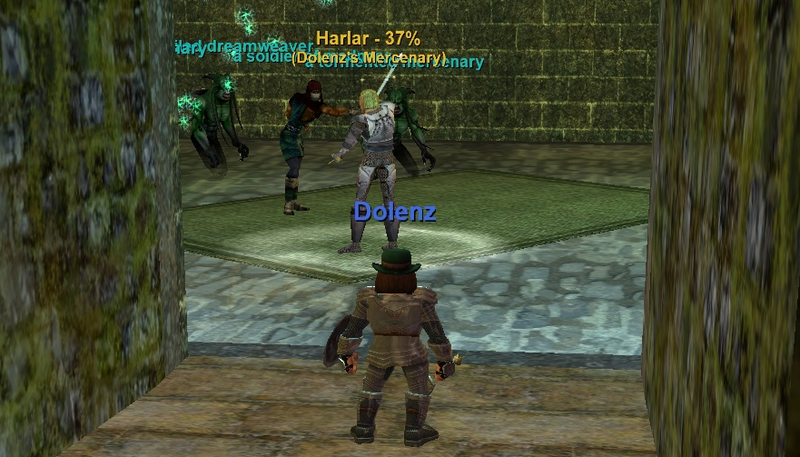 The daily hot zone quests for levels 20, 25, 30, 35, and 40 were all pretty much in Antonica or Kunark, which meant I could find them by just looking at the in-game atlas and tracking back to a nearby zone that had a teleport from the PoK. Actually, I went to the Paludal Caverns for one of the earlier quests, but that wasn’t too difficult. I generally go to Zam, look up the zone, then look up the connecting zones to see if I know how to get to any of those, then the zones that connect to those, by which point I have usually found a landmark or a place with a portal on the PoK. No so with the Scarlet Desert, the path to which you can see nestled in on the right side of the map, as well as on the south east side below the Twilight Sea. Easy points of reference, like Shar Vahl, the city of the Vah Shir cat people, were multiple hops away, leaving it looking like a long way to walk. 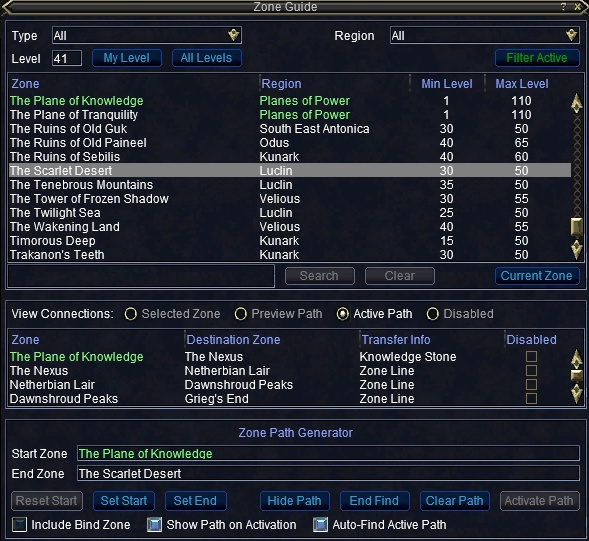 While fiddling around I discovered… or rediscovered, since I am sure I saw it at some time in the past… I guess that was about five years ago at another anniversary… the zone guide interface. This lists out the many zones in the game and will attempt to chart a path to your destination. A great idea! I got it set to direct me to the Scarlet Desert and set off to follow the wisp. The route seemed to be okay. It did not include the need to go through an NPC, which I discovered five years back, breaks the pathing… and possibly your ability to follow the path if the NPC is no longer there. The wisp can be comical at times, following a strict angled path along roads at times, while at other times lighting off and heading straight up almost vertical slopes at others. One of the things I forget about EverQuest is that you can run up cliffs that would be impassible in other games. But the wisp knows where you can go up. Going down, at least without taking damage, can be another matter. I didn’t have any life threatening falls, but I took some hits going down steep slopes. Everything was going find until I zoned into Grieg’s End. The first room in the zone had three aggro level 54 mobs. With Grieg’s End seeming impassible for now, I gated us back to the PoK to look into another route. The guide had actually offered up three and I had just taken the first one. I excluded Grieg’s End from the list and took the next one offered. This one routed me through several routes to the Twilight Sea and, from there, to the Scarlet Desert. As before, the trip started smoothly enough, until I arrived in the Fungus Grove. The mobs there were not as high level as Grieg’s End, but still a bit higher than my merc and I. We dealt with a few solos, but accidentally got embroiled in a mass of attacking mushrooms that was clearly going to overwhelm us over time. I decided to leave the my merc to his fate and just run for the zone line following the wisp. But the wisp led me to a dead end… which was soon my dead end. I was down and back in the PoK again. Thinking there had to be an easier way, I went to Google to search for routes. Somebody wrote that the easy way to get there was via the Guild Lobby off of the PoK. There was a portal there that would drop me just two connections from the Scarlet Desert. Unfortunately, one of the zones was a level 90+ area and I was one-shotted before I knew it and back in the PoK again, this time down a level. I forgot that you could lose levels. Time for another route. If longer is safer I’d be okay. The route updates as you go along, so that was a few zones into the trip. This route, again, started out swimmingly. The main problem along the way, was that the Chelsith Reborn zone was about on level with me and full of aggro mobs. 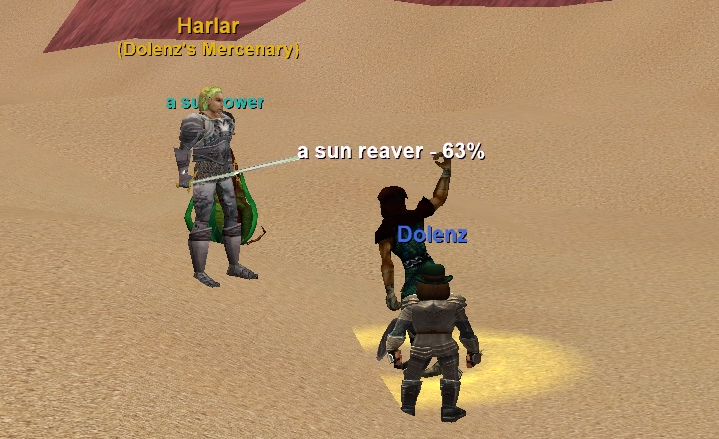 It also has that classic EverQuest feature/flaw where the mobs are all on the same pathing, so my merc and I ended up being stuck in one spot for over 30 minutes fighting off a seemingly endless series of adds that would wander up and join the fight. On the bright side, Chelsith Reborn was also flagged as a hot zone, which meant bonus experience. I recovered level 41, made it to level 42, and got a hair into level 43 just standing around slaughtering elementals and raptors during that time. As lucrative as that was exp-wise, I did want to move along. So I made it to the cave that zoned me into The Grey and started carefully looking around there. It seemed safe. I threaded my way around the dangers marked on the map when I suddenly noticed that the little breath meter was up, the one that you get when you’re under water. The zone was airless. I died. And lost level 43. I called it a night, but returned the next day to give The Grey another try. I got my level back and padded it a bit in Chelsith Reborn, then got to the zone line determined to make a straight run through The Grey to the Scarlet Desert. At about the halfway point, some mobs chasing me, and my air almost gone, I figured I was not going to make it. You need to be going faster than I could manage to cross the zone in time. Fortunately I had my Gate spell on my spell bar and I was able to land safely back in the PoK. Again. Having used the three recommended paths to the Scarlet Desert, I decided to pull back and see if maybe it would recommend something different if I specified the Twilight Sea instead. And, as it turns out, yes, it does. That was a long path. The run through the Katta Castellum was especially long, though it was probably worth the trip just to see it. It is an example of the EverQuest dev team not being afraid to build on the epic scale. And the swim across the Twilight Sea leveled up my swimming skill nicely. But best of all, I arrived safely in the Scarlet Desert. Now I just had to find five of the mobs I needed to slay in order to complete the task. That can be a chore, and I wasn’t having much luck. On the big mesa in the zone I spotted one of the mobs named however, and decided to give it a shot. There things went south. I didn’t get just the one mob I wanted, he was linked with two others. Still, a triple pull seemed within the bounds of our capabilities. They were all +/- 1 level to us. However, for no particular reason I could see, I had a moment of merc berserk as he suddenly ran off and collected up every other mob in sight, leaving me high and dry with the three original mobs who proceeded to beat me into the sand. And there I was, back in the PoK again. So I ran back. Visited the castle. Improved my swimming some more. Then started in again on my mob search. I tried the same mob again, thinking it might have been a glitch. It wasn’t. My merc just goes crazy up there. Fortunately I stood a ways back this time and was able to zone out before my merc died. Time to hunt elsewhere for mobs. Around the mesa I did find similar mobs and eventually some of the ones I wanted started to spawn. I found my five, got my nice bit of gear, and ended up just shy of level 45. Not bad. It would have been better if I had been able to do it all right the first time. But this way I did see more of Norrath… my zone achievement count went up quite a bit… even if it took me three evenings to get it done. And then I had to gate back to the PoK because to get the quest for the next day I had to go back and speak to the hot zone guy again. So I will be traveling some more. This entry was posted in entertainment, EverQuest and tagged Plane of Knowledge, Scarlet Desert, The Shadows of Luclin, Vox on March 26, 2019 by Wilhelm Arcturus. Invisibility plus Brewall’s maps and you would have made it through Grieg’s End on your first try. None of the mobs you would run across in Grieg’s End see through normal invis. Invisibility plus Brewall’s maps and you would have made it through the Fungus Grove route just fine as well. As a cleric, you want to buy a couple stacks or three or four of Cloudy Potions. These are instant-cast invis (put them on your hot bar) and are really invaluable. Even classes that can invis themselves keep a stack or two around because of the instant-cast nature of them. Several vendors in Plane of Knowledge sell these for around 10p per potion. And I was wondering as I read the post whether you were going to suffocate in The Grey. Sorry that you did as I was sitting here thinking “I hope he saw that emote about no air when he zoned in” as I was reading. But that’s one subtle emote and I’d have missed it too likely. Definitely the quickest way to the Scarlet Desert, other than getting a port from a druid or wizard to the Twilight Sea which is one zone over, is the Bazaar > Shadowhaven > Echo Caverns> Fungus Grove > Twilight Sea route. I was wondering if you were going to comment on the very, very scarlet nature of the Scarlet Desert. Wear your shades for that one! Enjoyed the read as usual. It’s fun to see these stories that really only seem to happen in EQ. > But the real irony in all of that… the damn quest is called “A Simple Task. That was an awesome story. Thanks for sharing! @gnomenecro – I went looking for a potion or gear solution to a travel problem, but I was looking for something that would let me breath in The Grey. I did not have any luck. Again, I regret not rolling a druid. SoW might have gotten me through The Grey and they have enduring breath as a spell at some point to as I recall. Also, the whole travel thing. Damn, why didn’t I roll a druid? A potion of invisibility would be good. A very TorilMUD solution to things. I’ll go look for cloudy potions. That was epic! I’ve done all that and done it several times over (although Chelsith Reborn is a totally new one on me – never even heard of it. Going to have to go an look that one up). Scarlet Desert is one of my favorite zones in the whole of EQ. I have spent so much time there over the years, in full groups, duoing and solo, with any number of characters. It’s always been a good xp zone even without the Hot Zone bonus but it’s also always been a total pain to get to. Once I got there I tended to stay put for a few levels. I never really liked the trip through Fungus Grove, although Gnomenecro is right that it has always been considered the short and easy route. It’s true that nothing in FG sees invis but you know how reliable invisibility is in EQ. I also always hated the swim across Twilight Sea, which is a zone I don’t like at all. I always preferred the run through The Grey, which is much shorter. You should try to get an item with Faerun on it, or failing an item, buy some Philters of Faerun. That will give you water breathing (works just as well for vacuum, which is what The Grey is – it’s open to space) as well as See Invis and Ultravision. In fact, if you haven’t already, you probably want to look into the various worn efects you can have. Not sure what levels they come in without checking but it makes a big difference (although not as much as the incredible difference AAs eventually make – I’m so used to having unbreakable invis and no-reagent-required levitation on hot keys on my Magician that when I play characters without those AAs I think something must be bugged). Franklin Teak’s choice of Hot Zones is a bit hit or miss – especially at higher levels – but I think they changed it a while back so you get more choice. If you don’t like the one you get you might try deleting it, waiting a day, then trying again. They change now, I think. I was curious, so I just logged in to check. The “Potion Vendor” in the building in PoK where all the Alchemy supply merchants are doesn’t sell Cloudy Potions but I remembered I used to buy them in that middle building opposite the Soulbinder. The confusing thing here, typical EQ, is that the vendor in there who sells them, Mirao Frostpuch, is clearly marked as a “Poison Vendor”, so why would you even look at what he sells? Well, you should, because he not only sells Cloudy Potions that give Invisibility but he also sells Fish Gill Extract, which is a potion of Enduring Breath! Plus a bunch of other dodgy potions as well. Clearly this is something rogues like to keep to themselves. They are a bit pricey for a low-mid level character at around 11 Plat each but they will do the job. Philter of Faerune is player-made and on Strom/Luclin there were none for sale in The Bazaar. Farune as a focus effect is on the head slot items of Defiant armor but I don’t think it comes in until Elaborate Defiant, which has a Required level of 59. You can get an Elaborate plate helm in the Bazaar on my server for 300pp. @Shintar – WordPress puts it at 1,969 words, so good estimate. And I guess that is the ideal state of the blog, a blob of text about things going comically awry and me trying to figure out how to just finish the task at hand. Problems are always more interesting than instant success. Merc berserk is just something that came to mind when I was watching him start running about and collecting every mob in site. It fits I guess. Ah, the joys of EQ…. it’s not the destination, it’s the journey! Life is an adventure to be experienced….. 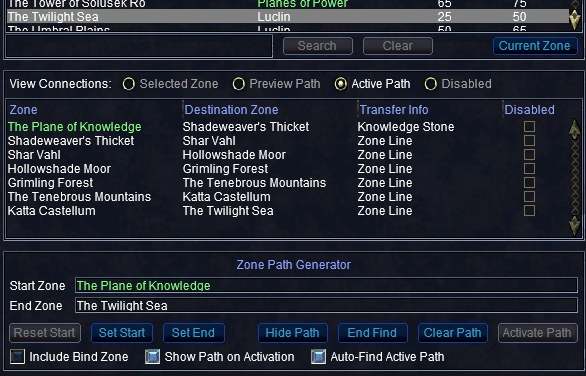 I left EQ a long time ago, I hadn’t realised there were that many zones nowadays, that is amazing.